Blu-ray authoring is a relatively recent addition to the list of authoring services we offer, and in a short space of time has proved popular for in-store and promotional use, as well as retail products. No other disc format comes close in terms of picture quality, and with 5 times the resolution of DVD, it’s easy to see the difference. With the increased flexibility and quality of compression codecs such as AVC and H264 the capability of the format is leaps ahead of the humble DVD. The additional authoring options available on Blu-ray make for a more involving experience, with pop up menus and navigation possible even while a feature is playing. 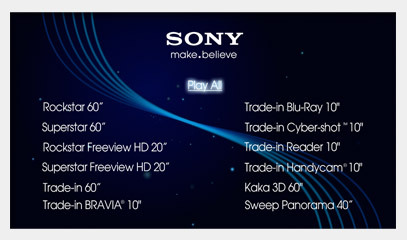 The next generation of connected Blu-ray players will mean integration to live information and content that can be updated on the fly. 10th Planet authors Blu-ray from HD Quick Time files, HDCAM, HDCAM SR and other popular HD sources. Our dedicated authoring team will tackle everything from simple autoplay discs to fully featured projects with multiple motion menus. If you would like a quote on your next project or some guidance on the difference between BD-AV, BD-MV and BD-J then please get in touch.